Think spring with me... rainbows, rain showers, and bunny rabbits! Today we are sharing a fun, hands-on spring activity for toddlers and preschoolers. Work on color recognition, fine motor skills, and more with this cute Bunny Tails Matching Activity! I mean, how cute is this bunny tail activity?! And bonus that it incorporates very important skills for toddlers and preschoolers! Color Matching Bunny Tails is a simple and engaging activity for your toddler or preschooler. It is a perfect spring themed fine motor skills activity! It also works on color recognition with the young ones. Add this spring activity to your tot school shelf. This matching bunny tails activity works on color recognition and fine motor skills. 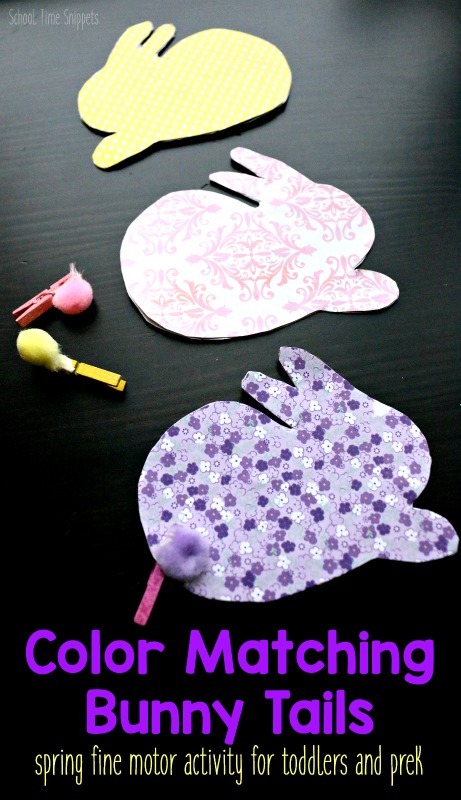 The cute bunny templates may also lend an opportunity for pretend play. Alas! 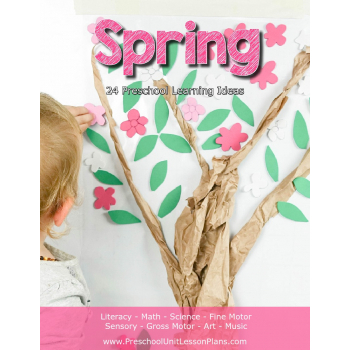 There are many concepts to be taught with this fun spring activity! Small Clothespins ( I also think the tiny clothespins we used required extra hand-eye coordination and concentration). Making the rabbits was the most time consuming part of the whole activity. I found a rabbit template that I liked online and with a little free hand alterations, I came up with something I was happy with. I traced my template onto cardboard and the scrapbook paper, and then cut them out. I used cardboard so that the bunnies would be a bit more sturdy while being used with little hands, although, if you have access to a laminator, you could skip the cardboard. Next, glue your pom poms onto the clothespins. Finally, invite your child to come explore, match colors, and work on his/her fine motor skills. All three kiddos had their hands on this activity at the very same time, so needless to say I don't have very many good pictures as someone was always moving and/or in the way. Have your child match the color bunny tail to the corresponding color bunny. However, allow for free play and have your child work on their fine motor skills by mix and matching bunny tails, too! Try this adorable color matching activity with your toddler or preschooler this spring! Work on fine motor skills. For a competitive kiddo, try timing him/her to see how fast they can match all the bunny tails to the correct bunny. Hid the bunny tails around the house for a scavenger hunt. Save the activity in a ziplock bag for road trips, appointments, dinner time, etc.! 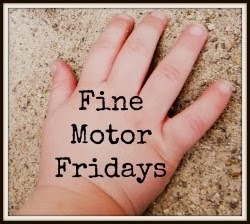 I am loving being able to share fine motor skills activities with you through our Fine Motor Fridays series! I'm a big fan of incorporating color into our activities, hence our Color Matching Velcro Tower. Yep, I love velcro, colors, & clothespins -- OH MY! 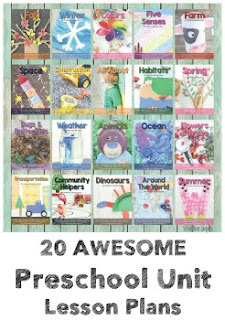 You might also like these 25 Spring Fine Motor Skills Activities. 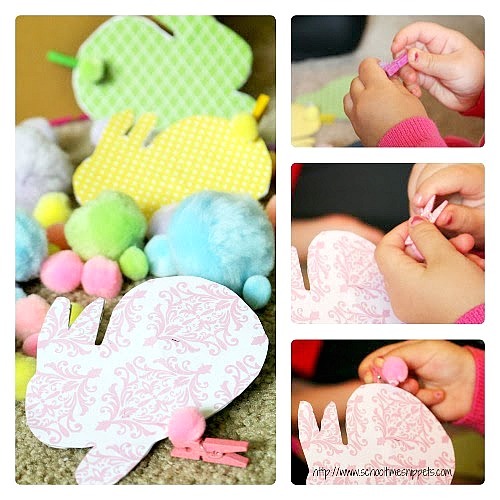 18 comments on "Color Matching Bunny Tails: Spring Activity for Toddlers"
Adorable and useful! I love it! These are adorable...I want to play with them!! Love this activity! Brilliant Easter-themed color matching! Thanks, again, for sharing today! So cute!! I love this. I'll be featuring you tomorrow on Share It Saturday. Thanks for linking up! Not gonna lie, I played with them too! Ha! Thank you, Darla! It was a little involved in preparations on my end, but it'll be a great activity to break out often! Little late in responding, but I am SO glad you love this series! It has been a fun one for all of us to take part in : ) Enjoy this and all the other activities! Spring crafts always seem to be so pretty and colorful and this one is no exception! So, so cute! My daughter loves rabbits and I know she'll love it!! Hello! I love the rabbits. Would you please post where you found the template - or post your own modified version? That would be such a blessing! Oh my goodness! This is the cutest activity! Kids will love this so much they won't even realize they're getting a fine motor workout! :) Can't wait to try this with my kids at school - love that I could change up the size and type of clip based on age and ability level! Thanks Claire! 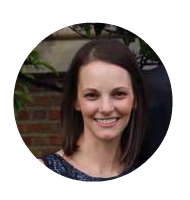 Glad you like them and can use this activity with your kiddos! Ruth, I don't recall where I found the template. I just googled bunny images/ clipart and worked with one of them. Maybe check out pixabay for a template? If not, I'll try and trace my bunnies, scan them, and upload them... Not even sure that would work, but I could try if you don't find anything else. Let me know! What an adorable color matching activity! Thank you! I found some - I just think yours are the cutest! Thank you! I thought I replied yesterday, but I don't see it, so I probably didn't finish it. I did find some images like you said, but I still think yours is the cutest!! Oh thanks, Ruth! I'm glad you found something that would work. I just wasn't sure I'd be able to scan them-- never done it! But if I remember, I may try it!